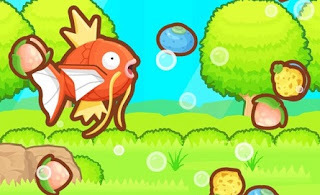 Pokémon: Magikarp Jump is a mobile video game that does not need any special skill to prove yourself in the fighting. If the JP value of your Magikarp is higher than that of your opponent, then you have a good chance to be the winner. So the goal is to be quick to level and to train well, after all, you have to build new generations. - Name Magikarp: If you have caught a Magikarp, you can give it an individual name. Just go to the menu and click the Trainer icon. Now scroll down and click on Change to enter an individual name. - JP, bounce and food: Magikarp is hungry and you should always feed him well to increase his JP. The higher the JP value, the better the jumping power of your fish. To feed Magikarp, you have to tap the food pieces in the aquarium and push them in its direction. Gradually, new food will appear and you can continue to feed the Pokémon. You can also increase the JP with training and the helpers. - Use coins for the training: At the beginning of the game you get many coins relatively fast. You should invest them the same in "training". Go into the coin store in the city and graded up the sandbag. For the first upgrade you pay five coins. But if you invest a little more, namely 17 coins, then you can increase the JP while training at the Sandbag to 35 to 115. This is really worth it! Then the success is almost as effective as the jump counter. This is important because the training unit is always randomly chosen. Next, the food is on your list. Magikarp is very voracious. But wait until you get to rank 3 and save your coins. - Training: When training you get fast JP. At each training, you get training points that you should not save but rather invest immediately. After about 30 minutes you get a new training point and you can carry a maximum of three at a time. Furthermore, you should have spent all the training points before a rank upgrade, otherwise they would be regenerated and that would be very bad. You should also upgrade your training equipment regularly, as you can reach more JP. - Decoration: Yes, there are decorations in Magikarp Jump. You will receive your first decoration item when you have completed the Friend League. It is a fishing prohibition sign. Just go to the menu and then go to "Decorate", from there you can use the deco object or in this case set up. You should also do this immediately because it increases the amount of feed by 1. But there are a lot more decorations. You can buy them in the diamond shop. - Events: Sometimes you get a special event. Usually this happens either after training or after a fight. In these so-called events, you can make great rewards. You can choose between two actions. Better be on the safe side and choose the cautious ones first. In the worst case, you lose your Magikarp at the event. - Diamonds: In addition to the coins there are diamonds in Magikarp Jump. Since you get a relatively large number of diamonds at the beginning, you might think it would be like sand at the sea. But that is not so, because later they become less and less. You need the diamonds to pay the Pokémon helpers. These are quite expensive. Therefore, you should use the diamonds sparingly and consider exactly what you want to spend on them. They are most effectively applied to helpers or decorations. You should avoid diamonds for coins or ordinary items. - Individual Magikarp: While each Magikarp's JP is firmly tied to the respective level, each Magikarp at Level 18 has the same JP value, but you can have your Magikarp stand out from other Magikarp by individual abilities. For example: this is the case when you use bonuses for the food or during training. But also with Magikarp with rare patterns increases the chance that they get more great abilities. - Achievements: From your menu, you can find out what achievement you can get in Magikarp Jump. This should not be neglected, as there are great bonuses for the conclusion of achievement. These include diamonds or coins that are useful to you in the game. Per success there are five stages to achieve. The first of course is very easy. The rewards are not automatically packed into your inventory, you have to pick them up - do not forget. - League and Pikachu : If you have the first training behind you, you can prove in the league. In doing so, your Magikarp must compete against others in the jumping competition and deliver the highest jump. Usually there is a reward, like coins. In the beginning, you should be particularly fond of the Friend League and the Great League, as beginner you can get the most experience here. In addition, you should complete the Friend League in any case, because then you get not only diamonds, but also Pikachu. It guards the aquarium and helps you to improve Magikarp steadily. Just type Pikachu whenever it has a star icon above your head.